Since 2001 the V&A has undertaken a comprehensive programme of restoration and redesign known as FuturePlan. Contemporary designers are creating exciting new galleries and visitor facilities, while also restoring and revealing the beauty of the original building. The first phase of FuturePlan began with the opening of the British Galleries, in 2001, and finished in 2009 with the opening of the Medieval & Renaissance galleries. During this phase, the V&A completed 43 projects, transformed 26,500 square metres and reclaimed 3,000 square metres of back of house space for galleries and public areas. To realise this, the V&A worked with over 50 architectural, design and engineering practices and raised £120 million from private donors and funding bodies, including substantial grants from the Heritage Lottery Fund. The completion of the V&A Exhibition Road Quarter marks a major milestone in the second phase of FuturePlan. The V&A's Cast Courts are the museum's largest and most dramatic spaces, housing an encyclopaedic sourcebook of casts amassed over 150 years. In 2014, the East Court reopened as the Weston Cast Court after a full refurbishment, unveiling glories such as the cast of Michelangelo's David. In 2018, the renewed West Court, home to the towering Trajan's Column, was renamed the Ruddock Family Cast Court. In addition, the Central Gallery reopened as the Chitra Nirmal Sethia Gallery, a brand-new space exploring the history, significance and contemporary relevance of casts. This has ensured the Cast Courts remain the most important national and international centre for the enjoyment, understanding and study of plaster casts. 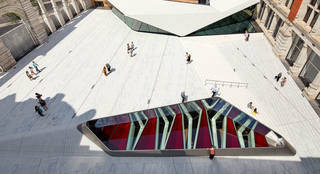 Phase One of the new V&A Photography Centre was opened on 10 October 2018, by the V&A's Royal Patron, Her Royal Highness The Duchess of Cambridge. The refurbishment has more than doubled the permanent gallery space for photography, enabled us to digitise our collections, and created an upgraded state-of-the-art storage facility. The first display takes the theme of 'Collections' and presents a sweeping history of photography, from the earliest daguerreotypes to digital photography. Contemporary work and specially commissioned photography is hosted in the Project Space, the first of which is a series of photographs by Thomas Ruff, exploring Captain Linnaeus Tripe's 1850s paper negatives of India and Burma. A Dark Tent projects films showing photographic processes, techniques and projected photography, as well as providing space for activities and film screenings. And the Digital Wall, a grid of nine screens, displays cutting-edge works of digital imagery. Phase Two (opening in 2022) will establish an impressive photography library and study, two flexible learning and event spaces, and a photographer’s studio and dark room. The innovative design by architects Carmody Groarke converts a magnificent top-lit gallery on the top floor of Aston Webb’s Grade I Listed 1909 wing into a beautiful new dedicated space for V&A Members, outfitted with bespoke designed furniture and fittings. Formerly a study room between 1916 – 21, and later the National Art Library offices, the transformation returns this room to its core principles as a place for contemplation, creative thought and enjoyment. The V&A Exhibition Road Quarter is the Museum's largest architectural intervention in the last 100 years. This innovative and ambitious project provides beautiful new public areas and gallery spaces for London, transforming the experience of the V&A for visitors, and revealing historic façades of the existing Grade I listed buildings for the first time. Visitors can enter the V&A Exhibition Road Quarter through the arches of the renovated 1909 Aston Webb screen, opening up the Museum to its neighbours on Exhibition Road. The new spaces include The Sainsbury Gallery, The Sackler Courtyard and The Blavatnik Hall. The V&A Exhibition Road Quarter has been generously supported by The Monument Trust, The Dr Mortimer and Theresa Sackler Foundation, The Headley Trust, Blavatnik Family Foundation, the Garfield Weston Foundation, the Heritage Lottery Fund, Peter Williams and Heather Acton, the Friends of the V&A and many other donors. Following an eight-week renovation period, the shop was transformed into a cutting-edge space that showcases the best in design, materials and innovation. The designs aimed to uncover the true architectural skeleton of the site, both retaining elements of the original structure, and constructing new display systems around it. The result is the magnificent new shop in which visitors can see both the historic fabric and later additions, such as our 3D printed tiles, all of which bring together the story of the building's development from the late 19th century to today. These galleries contain some of the most magnificent and elaborate works of art and design in the collections. Around 1,100 objects exploring European art and design between 1600 and 1815, including spectacular examples of textiles and fashion, painting and sculpture, ceramics and glass, furniture and metalwork, prints and books are now represented in stunning new galleries. By stripping out interiors built in the 1970s, the original Aston Webb architecture was revealed and over 350 square metres of gallery space was brought back into public use. The original parquet flooring was restored, and long vistas through the suite of rooms were created by remodelling the space. Europe 1600 – 1815 has been made possible thanks to the generosity of the Heritage Lottery Fund (HLF), the children of Her Highness Sheikha Amna Bint Mohammed Al Thani, the Friends of the V&A, The Selz Foundation, Würth Group, The Wolfson Foundation, Dr Genevieve Davies, William Loschert, the J Paul Getty Jr Charitable Trust and many other private individuals and trusts.